It is my turn this week to host a challenge at the High Hopes blog. And I came up with another sketch for you to try :) My fellow Design Divas came up with absolutely stunning creations, so it's worth a peek!! Diese Woche bin ich an der Reihe eine Challenge auf dem High Hopes blog zu stellen. Ich habe darum einen Sketch designed, der euch hoffentlich inspirieren wird :) Meine Design Team Kolleginnen haben wieder tolle Werke gezaubert. Es lohnt sich also vorbei zu schaun! A friend of mine recently graduated from political sciences (his 3rd graduation...*phew* what a genious...LOL) and I wanted to send him a special but funny card. I cut, embossed and stenciled (is this the right form of the verb??? 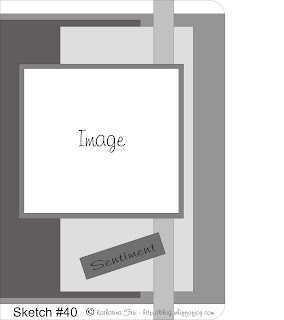 LOL) the border of the black SU cardstock with Spellbinders Pierceabilities (if you click on the picture you'll get a bigger view on which you can see it a bit better). The design paper is from My Mind's Eye (the Laundry Line collection). I created the sentiment on the computer and cut it with Spellbinders Tags Trio. 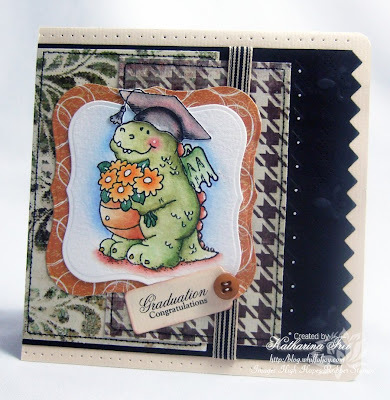 Ich habe den Rand des schwarzen SU cardstocks mit Spellbinders Pierceabilities bearbeitet. Damit könnt ihr Stanzen, Embossen und danach noch Piercen (also mit einer Nadel ein Muster ausstechen). Wenn ihr auf das Fotos klickt, erhaltet ihr ein größeres Bild, dort kann man es besser sehen. Das Motivpapier ist von My Mind's Eye. Den text habe ich am Computer erstellt und ihn mit Spellbinders Tags Trio ausgestanzt. Ich habe ausserdem die Innenseite meiner Karte und das Kuvert dekoriert, um dem ganzen den finalen "speziellen" Touch zu geben. Diese Aussicht hatten wir heute wenn wir aus dem Fenster geschaut haben. Meine Zwei haben sich tierisch auf das Herumtollen im Garten und auf das Schlittenfahren gefreut :) Ich hoffe ihr habt auch ein vergnügliches Wochenende! There is a new Whiff of Joy release coming up, so stay tuned to be the first to discover what's next in WoJ land. This is absolutely stunning, Katharina! Albert looks so intelligent in his grad cap! Thanks for the wonderful sketch this week! 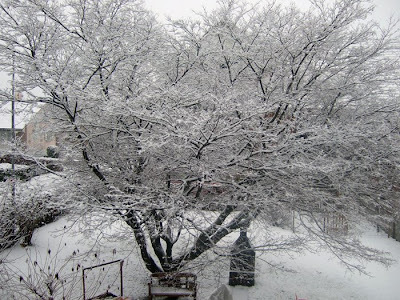 And I'm glad that view is from YOUR window & not mine ~~ I'd be happy if we got no more snow!!! I want to see some green!! Lovely sketch and a wounderful card! Great winterphoto! Perfect fot winterplay! Over here it's TOO MUCH snow! :o If I let mine out they dissapare in the depth of the snow! What a fantastic card & sketch Katharina! Albert is adorable in his graduation attire! Deine Karte ist total klasse und der Sketch sieht auch richtig schön aus. Der inspiriert sicher viele zum mitmachen. 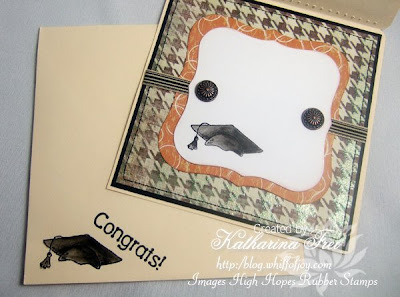 What a gorgeous graduation card.. love the stamp, papers and embellies you've used.. it all fits together perfectly! The pictures look fab and I bet you had fun in the snow with the boys!! It's just started to snow here again, big flakes lots of fun! Oh my goodness, this is wonderful! So so pretty! Must of taken you long hours to make this! wow! Wish we would have snow in my city...all we have is rain right now! Cant do much fun outside when its raining!.....what a bummer! This is so adorable. I bet he will love it! I can't believe how well that graduation cap fits on Albert!! Perfect! As is your coloring! I had fun with this challenge as well (which I posted on my blog). It looks like your little ones are going to have so much fun! Katharina, that card is so beautiful, and so cute all at the same time! I love the graduation cap on the dragon, I never thought of that!! How hilarious and fun! I SO love how you used your sketch, the beautiful papers, and the fancy edge you gave it! This is just awesome! But man, your boys look like two little angels who came from heaven!! They are so precious!! Great Sketch-I will have to give this a try. Very cute card. I especially like the inside and the added acknowledgement on the envelope. Hi Katharina, I'm looking for a graduation cap stamp and this would be perfect - is it High hopes as well?